It takes a certain type of object, event or situation to use the descriptor “frickin’ sweet” instinctively and non-sarcastically. The new Nissan Leaf electric race car from the company’s Nismo performance division, which weighs as much as a Mazda Miata and looks like it’s straight out of a video game, is frickin’ sweet. Nissan announced the car on Thursday as the second generation of the Leaf Nismo RC car—not to, but which easily can, be confused with the regular Leaf Nismo hatchback, which went on sale to everyday buyers in Japan earlier this year. The Leaf Nismo RC lineup is instead a much smaller, non-road-oriented lineup, with only a few models made for track and exhibition use. 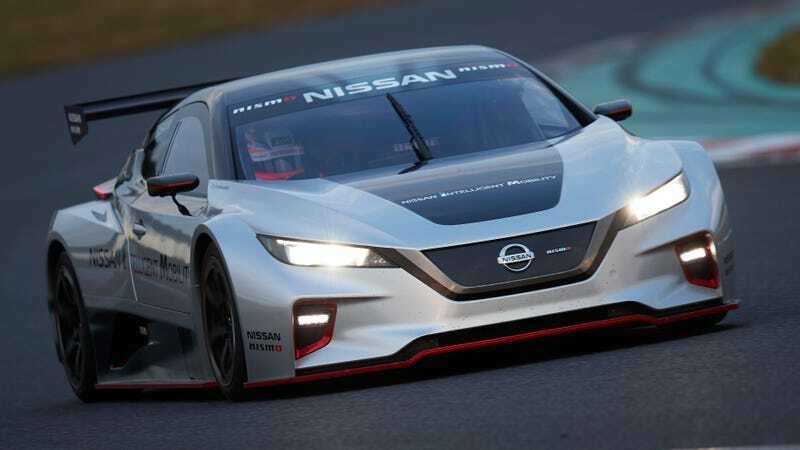 Nissan said in its press release that this second generation of the car has more than double the power of the first Leaf Nismo RC, which came out in 2011 as a strange little race car that looked like a hatchback that lost a fight with a giant rolling pin. That first Leaf race car weighed around 2,050 pounds and had a carbon-fiber body, 107 horsepower and 207 lb-ft of torque, Motor Trend wrote at the time. The new one weighs 600 pounds more and has 322 HP, which is a refreshing break from the usual on electric performance cars—the current obsession with four-digit horsepower is silly, especially on electric cars with instant, glue-you-to-your-seat torque. It also completely leaves the Leaf production design in the dust, making the car look like something you’d want to watch on track rather than some dramatized version of a car people only buy for their newly licensed teenage kids, without the performance to back up the revamped looks. The new Leaf Nismo RC is all-wheel drive and has about 472 lb-ft of instant torque, Nissan claims, and its power-to-weight ratio lets it get from 0 to 62 mph in a claimed 3.4 seconds. The Leaf Nismo RC is also so wide and low to the ground, it’s actually shorter at the roofline than the tiny production Leaf. Top Gear reports Nissan will build six of these to use as demonstrator cars at Formula E and other track events. Would a spec series be nice? I vote yes. Now that we’ve got a feel for this new Leaf Nismo race car, let’s run down the checklist. Electric race cars that are designed to make more than a couple of laps on track? Good. Cars that focus more on power-to-weight ratios than on adding more and more power? Good. Racing concepts that do more than put a couple of stripes on the hood to go along with unspecified “performance tuning”? Good. It appears, then, that the new Leaf Nismo RC is good. Frickin’ sweet, even.